The United States Environmental Protection Agency has taken a dramatic turn under the Trump Administration with the hiring of Scott Pruitt, the controversial politician who has opened up the floodgates for oil, gas and other high-polluting companies. The cozy atmosphere has not necessarily extended to the press however, as you might imagine considering the growing movement toward clean, natural energy and other next generation technology. And now, according to reports from multiple outlets, the EPA has banned reporters from two of the world’s biggest news publications from entering a key summit. According to this report from the website ThinkProgress, the Associated Press and CNN have both been banned from covering the EPA’s summit on chemicals, and one reporter from the AP was also forcibly removed from headquarters after attempting to report on it. She was reportedly “grabbed by the shoulders and forcibly shoved out of the EPA building,” the report continued. The events reportedly took place at a national summit on polyfluoroalkyl and perfluoroalkyl substances, known as PFAs, which are linked to potentially serious long-term health problems. Nearly 200 people attended, but missing were reporters from the aforementioned outlet and several others including E&E News. The AP reporter was said to have asked to speak to an EPA rep. when the alleged incident happened. Other reporters were allowed into the event but were asked to leave after the first hour, during which a representative from the American Chemistry Council, the main trade association for the chemical industry, was among the speakers. Is the EPA Limiting Potentially Critical Reporting? Also according to the article, a Freedom of Information Act request by the Sierra Club recently discovered internal emails showing how the EPA frequently discusses plans to limit reporting on key events with controversial topics like the chemical summit. They’ve even going as far as threatening to call the police on a reporter who wanted to report on a meeting between Pruitt and officials from North Dakota, the article said. The EPA has sparred with the press for several months now as they seek to protect the chemical industry, critics say. Last year the EPA’s press office sent out a release titled ‘EPA Response to the AP’s Misleading Story’ during which Michael Biesecker of the AP was criticized for writing what the EPA deemed an “incredibly misleading story” about Superfund sites and Hurricane Harvey, although the article points out that the EPA did not directly contradict any facts in it. 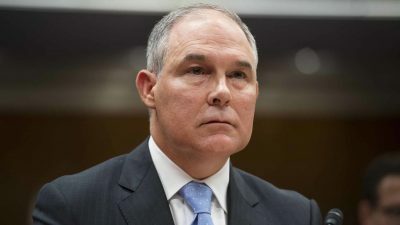 “Scott Pruitt is incapable of running the EPA without trampling on the health of American families and the freedom of the press in the process,” Sierra Club Resist campaign director Maura Crowley said about the day’s events according to the article. In addition to concerns about the current administration’s cozy ties with the chemical industry, their support for genetically engineered foods has also been vocalized, leading many to wonder exactly what may come next. But considering that GMOs are already not labeled and we’re already spraying millions of pounds of toxic, synthetic pesticides on our farmland each year and Biotech companies like Monsanto seem to be devoid of any strategies that don’t involve this paradigm, it makes sense to wonder if things will ever turn around. Several other countries have already beaten us to the punch when it comes to drastically reducing pollution and chemical industry influence, but unfortunately it appears as if the U.S. still has a long, long way to go.